Barbara Muir Paints: The most sensual meal? hotel, as room service. Please! The best. china, and silverware, and good cloth napkins. you want to linger in the room a little longer. this coooold day near the end of January. Labels: Yes! Breakfast is best. Acrylic on birch panel. Barbara Muir © 2014. Toronto. Canada. Thanks so much. I am having a happy time painting. Love your work. To me this is pure comfort food. Great style! 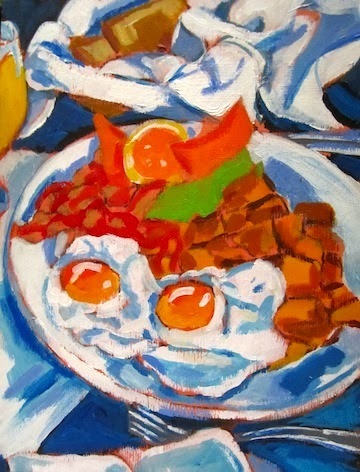 Looks delicioso - your painting is making me hungry. It will become even more delicious when I finish it. Can't wait to show you that. Yes it is. My guy has to have this meal when we order room service for breakfast, but in Quebec this is not at all like fast food -- it's delicious!! !